The networking event was meant to serve as a forum for discussion and information sharing among information officers. Mr. Mohammed Abbadi, Information Commissioner and Director General of the Department of the National Library, reiterated that the Department was very happy to cooperate with UNESCO Amman Office and CLD in increasing awareness around the Access to Information Law, and to facilitate the event. “Access to information is central to the 2030 Agenda and the promotion of the Sustainable Development Goals,” said Ms. Costanza Farina, Representative of UNESCO in Jordan at the event. “The right to access to information is intrinsically linked to democracy, the rule of law and good governance and therefore development, peace and stability. This is the reason why UNESCO is committed to support initiatives, like today’s networking event, that empower public bodies to implement the Access to Information Law properly and in full,” she added. In a statement to UNESCO, HE Dr. Mohammad Momani confirmed the strong commitment of the government to provide a proper environment that enables the implementation of the ATI Law. This comes as part of the government’s work to advance freedoms in the country, and protect the rights of citizens and society inline with international examples and models. “Freedom of expression and access to information are essential foundations of the European Union. In Jordan, we believe that effective implementation of the Access to Information Law will allow citizens to participate in key decisions that affect their lives. We are pleased to be supporting this initiative, and the Support to Media in Jordan project, to assist Jordanian information officials to share experiences and improve the flow of information in Jordan,” said Mr. Andrea Fontana, EU Ambassador to Jordan, in a statement to UNESCO. The series of trainings on ATI implementation, which took place between January and March 2017, successfully reached out to all 60 information officials in every government Ministry and other public bodies in Jordan, as well as several journalists and local trainers from non-governmental organisations and other bodies who will be able to carry on future training. As part of the same project, UNESCO and CLD developed an ATI Training Manual, which is available in Arabic and English. On 17 May, UNESCO also organised a refresher training session for trainers to further elaborate on specific issues such as handling exceptions in the Law and dealing with information requests. A team of international experts and local trainers ran the training workshops, during which the idea of establishing a network among trained information officers emerged. Today’s event was part of UNESCO’s “Support to Media in Jordan” project, a comprehensive project aimed at supporting Jordan’s efforts in advancing the Jordanian media to further increase its freedom, independence and professionalism. 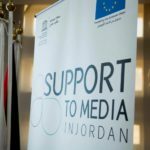 The three-year project (2014 – 2017) is generously funded by the European Union and implemented by the UNESCO Amman office in close collaboration with the Minister of State for Media Affairs and the media community in Jordan.